Welcome to Molokai's Official Scuba diving website. We will provide you with information about everything you need to know in order to dive on Molokai. Perhaps the most spectacular, untouched reef in Hawaii is the one that protects the south shore of Molokai. A Scuba diver's paradise, the 30-mile-long-reef offers outstanding diving. It features multiple turtle cleaning stations, blue holes, tropical fish, and endless miles of pristine coral. Molokai's reef is like no other in Hawaii with unspoiled waters and abundant sea life. It offers miles of fringing reef with nearly 40 different dive sites. This, along with almost no commercial activity, equals an extremely healthy, stunning reef that is full of life, waiting for you to explore! A common misconception is that diving on Molokai is only for advanced divers. The reality is that Molokai has dives for every skill & experience level. We can accommodate those who are interested in just trying to dive for the very first time to those you are looking for advanced level dives. The Molokai Fish & Dive is a fully certified Padi Dive shop. We offer dive courses for the beginner on through to the Divemaster. So whether you are just looking to get your gills wet for the first time or looking to obtain your next certification, we can accommodate you. Discover Scuba Adventure - If you are looking to try out diving, but you aren't sure if you want to go through the entire certification process, Discover Scuba is the class for you. You can take your class today and be diving in the ocean tomorrow! Open Water Scuba Diving Course - If you know that you are interested in getting fully certified we can also help you. This option, however, is a bit more time consuming and needs a bit more planning prior to your visit to Molokai. 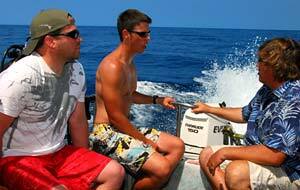 All of our diving is done via boat due to the geographical structure of Molokai. We have 2 US Coast Guard certified T Vessels the Ama Lua & the Coral Queen.